After a long day of work, it can be hard to find the energy to trek to the gym, change, work out in a crowded space, shower, change again, and then head home. This is why discerning renters are demanding the very best in fitness amenities. However, when it comes to luxury apartment buildings in Harrison, not all fitness centers are made equal. Too often, this space is an afterthought, with a couple of treadmills and some weights in a small, windowless room. 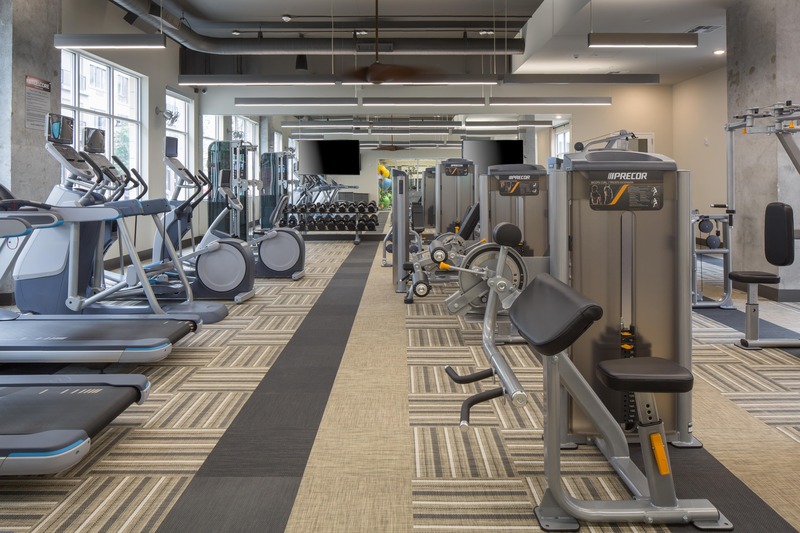 A great fitness center must feature a variety of equipment, to be sure, but it must also be an inviting space, and one that inspires each resident to continue on their fitness journey. If you’re serious about exercise, or looking to make fitness a bigger priority, Steel Works has the equipment, programming, and community that you’re looking for in your next home. SteelCore is Steel Works’ fitness center, where you can get a high-quality, hassle-free workout right in your apartment building. The space itself features high ceilings, and lots of sunlight, creating a welcoming and comfortable environment. Beyond the latest and greatest in cardio and weight machines, SteelCore also features virtual workout classes by WELLBEATS. This state-of-the-art system features scheduled and on-demand fitness classes, meaning there’s no need to rush to make that yoga class, or leave ten minutes early to get a good bike in your spin class. You can go home, change, head down to the gym at your leisure, complete a challenging class, and head back up to shower and relax. For on-trend cardio, Steel Works features its own, best-in-class spin room, dubbed SteelWheel. This space features brand-new bikes and plenty of space to stretch before and after your ride. Spinning is challenging but rewarding, and when it comes to the numbers of calories burned, few workouts are so effective and efficient. However, due to spinning’s popularity, classes are often packed (and expensive), so spinning a few days a week requires a meticulous game plan. That said, it’s easy to imagine the convenience afforded by living at Steel Works, where you can head downstairs to SteelWheel whenever you like. SteelCore and SteelWheel are just the beginning; Steel Works also features a virtual sports simulator, outdoor swimming pool, bicycle storage, and convenient access to the Riverbend District’s parks and trails, which are perfect for outdoor exercise enthusiasts. At Steel Works, we’re committed to providing residents with the very best in fitness amenities; come see them for yourself and schedule your tour today!